This interesting surname is of Anglo-Saxon origin, and is a locational name from a now "lost" place, one of the estimated seven to ten thousand villages and hamlets that have now disappeared from the maps in Britain. The prime cause of these "disappearances" was the enforced clearing and dispersal of the former inhabitants to make way for sheep pastures at the height of the wool trade in the 14th Century. Natural causes such as the Black Death of 1348, in which an eighth of the population perished, also contributed to the lost village phenomenon. The original place was in Berkshire, with the component elements of the name being the Olde English pre 7th Century "heorot", stag, and "hrycg" (Middle English "rigge"), ridge; hence "stag's ridge". Locational names were originally given as a means of identification to those who left their village or place of origin to settle elsewhere. The surname is first recorded in the latter half of the 13th Century (see below). On September 8th 1583, John, son of William Hartridge, was christened at St. Peter's, Cornhill, London, and Roger Hartridge married Elizabeth May on March 3rd 1605 at Stratford Subcastle, Wiltshire. A Coat of Arms granted to the family is a gold shield, on a black chevron three silver hawks' heads couped, the Crest being on a black portcullis lined and studded silver, a silver lion passant. 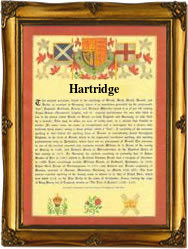 The first recorded spelling of the family name is shown to be that of Richard de Herterugge, which was dated 1272, in the "Book of Fees", Berkshire, during the reign of King Edward 1, known as "The Hammer of the Scots", 1272 - 1307. Surnames became necessary when governments introduced personal taxation. In England this was known as Poll Tax. Throughout the centuries, surnames in every country have continued to "develop" often leading to astonishing variants of the original spelling.